Depending on the size of your home and the distance of the plumbing pipes, some fixtures may require several minutes before hot water is delivered from a water heater that might be located some distance away. And how much water goes down the drain as you wait for that hot water to get delivered? In these times of sensitivity to water use, wasting hundreds of gallons of water is something to think about. If you are tired of waiting for hot water or don't like the idea of wasting water, you might want to think about installing a hot water recirculating system or having one installed. The principle of these systems is simple. A recirculating pump installed in the plumbing lines creates a loop that circulates the water in the hot water pipes back into the water heater for reheating, rather than letting this water go down the drain as you wait for warm water. This means that as soon as you open a faucet or turn on a shower, warm water is already present in those pipes. There are many options when it comes to hot water recirculating systems, so you may need to do some research to help you choose the system that is right for you. In a traditional hot water recirculating system, there is a dedicated return line for the hot water pipes that goes from the furthest bathroom or fixture back to the water heater. Near the water heater area, a recirculating pump pulls the water from the furthest fixture back into the water heater, creating a loop. This loop keeps hot water going throughout the house so when a fixture is used hot water is right there because the water in the hot water pipe is kept warm at all times. If you have a dedicated return line, then this is a great system to use. You can even get pumps that have timers built in, so the pump only runs during the hours you need it rather than all the time, offering you savings on energy costs. This type of recirculating system does not require a dedicated hot water return loop so that it can be installed and used in any house. Instant hot water systems come in many different varieties, so choose what is best for you. The two main pump locations are over-the-water-heater and under-the-sink. Over-the-water-heater: For this configuration, the pump is located above the water heater, and a check valve is located under the sink furthest away from the hot water heater. In this configuration, the pump pressurizes the hot side of the system and, through the bypass valve under the sink, it pushes the hot water into the cold water system, creating a hot loop. This loop can run constantly, or it can be used with a timer that may even be built into the unit. With the timer, you can just run the pump on during those times of day when you need quick hot water. Connecting the recirculating system check valve to the system under the sink furthest away allows the system to provide quick hot water all along the line because the hot water is circulating throughout the house. The instant hot water recirculating systems usually comes with everything you need to install it. Keep in mind, though, that you will need power near the water heater to plug in the pump. These systems are recommended for all types of pipes and are virtually maintenance-free. The biggest drawback with this type of system is that the loop pushes water into the cold side, that most distant fixture will initially have warm water in the cold water pipes when you first run it. It is quite a minor drawback, though. 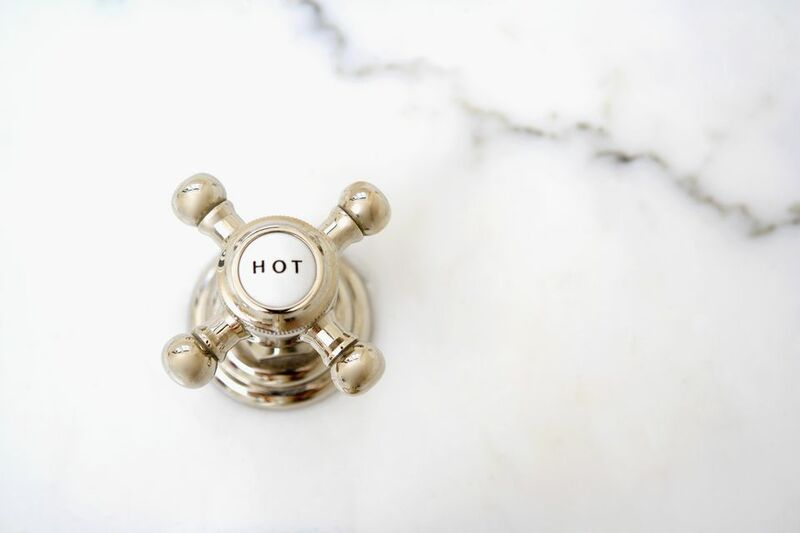 Under-the-sink: This style is installed underneath the sink furthest away and pushes the hot water into the cold line so you will have hot water to all your fixtures, as needed. Most models come with timers and often built-in sensors that will turn on when the water gets below a set temperature. This type of under-the-sink hot water recirculating pump will require power under your sink to operate. This type of recirculating system is similar to the instant recirculating system, but rather than running constantly, or at preset timed intervals, it requires the user to activate the pump when hot water is needed. It can be a traditional style with the pump at the water heater with a dedicated return line, or it can be an under-the-sink pump that is installed in the farthest sink and provides hot water throughout the house. When the pump is activated, it will pump cooled water in the hot water pipes back into the cold water pipe and push it back toward the water heater, creating a temporary loop as the water heats up. So, rather than that cooled water being wasted by going down the drain as you wait for hot water to arrive, it is kept in the loop and sent back to the water heater for heating. When the water arriving through the hot water pipe reaches the desired temperature, the pump shuts off, and the hot water runs out the faucet rather than looping back through the cold water pipes. This is a very efficient system because when the hot water is sensed at the pump, it automatically shuts off and stops pushing the water from the hot line into the cold side. Pushing a button may give the impression that you still have to wait for hot water, but the system can be activated by wireless remote or with buttons in multiple locations throughout the house, making it very convenient. Some systems also offer motion sensors that sense the flow of water automatically, turning on and shutting off automatically. Either way, having hot water on demand is a great option for saving water and conserving energy.